These plugins are for the ATI Remote Wonder Software to control the corresponding software with the Remote. Easy to customize, because many buttons can be configured. 04.09.2004: Almost every keycombination can be assigned to the 0-9 buttons. 27.08.2004: The programable keys A-F can now be configured to cycle through audiotracks. 21.08.2004: New option to cycle through subtitles. 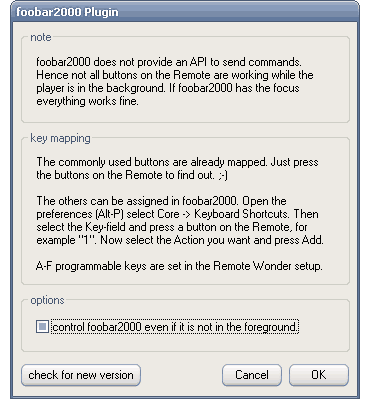 25.07.2004: Better compatibility with the foobar2000 plugin and Zoom Player detection speed up. 17.07.2004: Minor GUI changes and an updatefunction added. Stopwatch and Menukey are configureable now. 28.06.2004: The volume is now changed in the Zoom Player not in Windows. 21.06.2004: Toggle between window and fullscreen added. 09.06.2004: Zoom Player can now be controlled even if it is not in the foreground. To enable it press the "configure"-button in the ATI software. 29.08.2004: Fixed detection of ATI MMC. They changed the filename in the version 9.02.